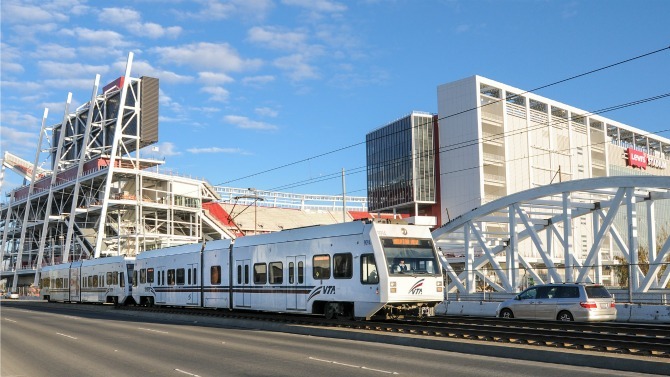 When the Detroit Lions take on the San Francisco 49ers at Levi’s Stadium on September 16, we want to remind fans that VTA will not be offering extra light rail service until the conclusion of the game. Regular service will be offered before and during the game. Augmented service will begin once the game ends. To help plan your trip, here’s a look at light rail service for the Lions at 49ers game on Sunday, Sept. 16. Kick-off is 1:05 p.m.
No direct trains to Alum Rock or Santa Teresa prior to end of game. Customers traveling toward Alum Rock must transfer at Tasman Station from a Winchester Train. Customers traveling beyond Convention Center can transfer to a Santa Teresa Train between Tasman and Convention Center. Runs for 60 minutes from the official end of game. Direct trains will augment regular service to the following locations - Winchester, Santa Teresa, Alum Rock and Mtn. View. Caltrain extra service train, Northbound train to San Francisco from Mtn. View will depart approximately 75 minutes from end of game or when full. For information on VTA bus service, visit our Levi’s Stadium page. Please note, Express Line 251 no longer operates from the Fremont BART Station and will now be operating from the Warm Spring BART station to Levi’s for events. For real-time information and trip planning, download Transit. You can easily plan your trip with up-to-the-minute accuracy and view arrival times for nearby VTA routes. Then try EZfare, VTA’s mobile payment app, to purchase your fare right from your smart phone. For more information, contact VTA Customer Service at 408-321-2300 or customer.service@vta.org.